There will be lane closures on the Hamilton Avenue Bridge over the Gowanus Canal from June 30 to September 3. The closures are necessary to facilitate replacement of the old bridge. The travel lanes on the Hamilton Avenue Bridge will be reduced from four lanes in each direction to two lanes in each direction. However,during rushhour from6 am -10 am on weekdays, three lanes will be maintained northbound (Manhattan bound) andone lane will be maintained in the southbound direction. During all other hours and on weekends there will be two lanes in each direction. Pedestrian and bicycle access will also be maintained at all times and bus service will not be interrupted. The Prospect Expressway Exit ramp to Hamilton Avenue will be closed on weekdays from 6 am to 10 am to reduce congestion in the area. For the recrod, the Hamilton Avenue Bridge is a "bascule type bridge" with two parallel leafs, one carrying the northbound roadway and the other carrying the southbound roadway. 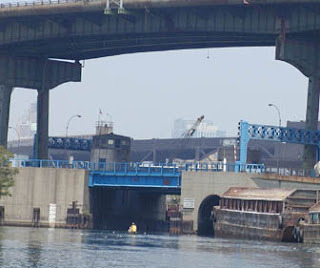 It was built in 1942 and carries traffic across the Gowanus Canal. The $55 million reconstruction will install new mechanical and electrical operating systems, improved navigation lighting for marine traffic, wider traffic lanes and other improvements. Work will be done in 2009.